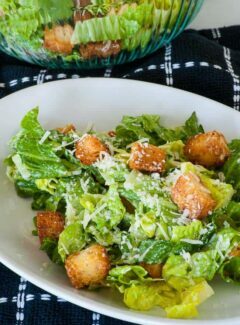 Caesar salad is usually my choice of salad when we go out to eat. At home, I’ve tried to buy caesar dressing in a jar but it never seems to taste quite right. 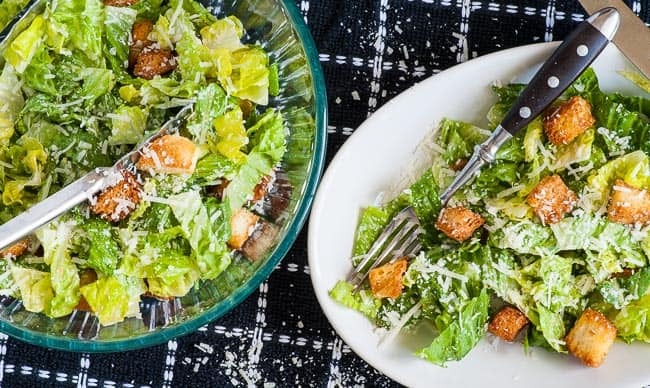 Making your own traditional caesar dressing is the way to go for a tasty salad. To make this dressing, I used an immersion blender so I hope you have one. If not, you can find a Kitchen Aid blender through this link. The blender makes it easy to make a smooth emulsion of the mustard, egg yolks and oil. Otherwise, use a whisk to make the emulsion. Also, instead of using store bought croutons, making your own is pretty simple. I used a French bread baguette, about one third of it, cut 3/4 inch slices then removed the crust and cut into one half to three quarter inch squares. Toss the bread with 2 tablespoons of olive oil and a teaspoon of garlic salt. Place on a baking sheet and bake at 400° for 5 minutes, toss the bread, then bake for another 3 to 5 minutes until golden. I coddled the eggs that I used to make the caesar dressing. Take the eggs out of the refrigerator and bring to room temperature. Boil 2 inches of water in a medium sized sauce pan. Lower one egg into the boiling water with a small kitchen spider or slotted spoon. Boil for one minute, then remove and place in an ice bath to stop the cooking, (about 2 minutes). Repeat with the other egg. This will heat up the yolk and reduce the risk of bacteria, (this will not ensure that the egg yolk is safe as it may still contain harmful bacteria). Separate the yolk from the whites. I find it easiest to break the egg into the fingers of one hand and let the whites dribble through your fingers. If you’d rather not be bothered doing the coddling, you can buy pasteurized eggs. I’ve also heard of people smashing up hard boiled yolks and mixing them in the dressing. That method is untested by me. One other method I have read about but have not tried, is to place the finished dressing into a small saucepan and gently bring the temperature up to 160°, checking the temperature with an instant read thermometer. I’m not sure what this would do to the texture of the dressing. Here’s a link to The Incredible Egg.org that has tons of information about eggs if you are concerned about their safety. This recipe makes about a cup of dressing which is enough for 3 good sized salads. Store the rest in the refrigerator or freeze for use later. Another popular salad dressing recipe is Newman’s Own copycat recipe for Southwest Salad Dressing. This traditional caesar dressing is just like you’d get at a good restaurant. It’s tangy, lemony, and a bit salty from the parmesan cheese. Just like you’d expect in a traditional caesar salad dressing. DISCLAIMER: This post contains an affiliate link which means Joe’s Healthy Meals will earn a small commission, at no additional cost to you, if you purchase anything through the link. 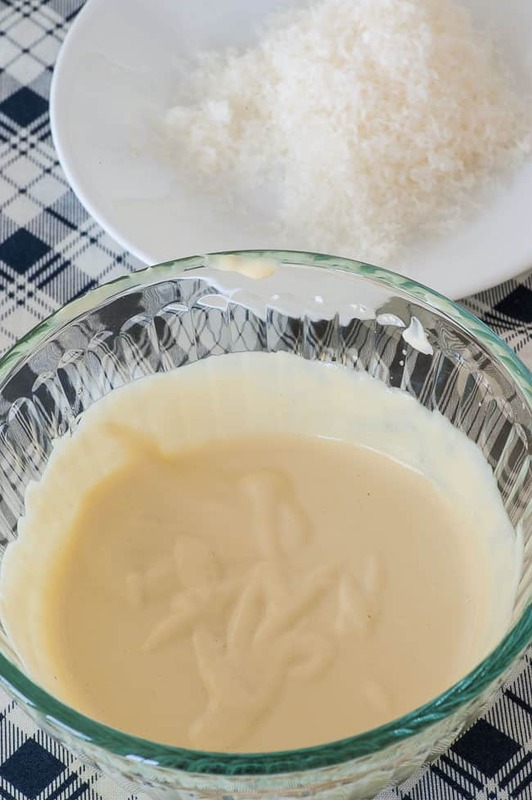 Put anchovy paste, garlic, egg yolks, lemon juice, dijon mustard, and canola oil in a narrow container, large enough for the head of an immersion blender. Blend until fully emulsified which will take 30 to 60 seconds. (If not using an immersion blender, place all ingredients in a bowl except the canola oil. Whisk vigorously while slowly adding the oil. Whisk until emulsified). Place the emulsion into a bowl and slowly whisk in the olive oil. Finally, whisk in the grated parmesan cheese. In a large bowl, place lettuce, and croutons. Toss with 3 or 4 tablespoons of caesar dressing, adding more if desired. Serve and garnish with additional parmesan cheese. Store leftover dressing in the refrigerator for up to 3 days, or freeze. Spot on! 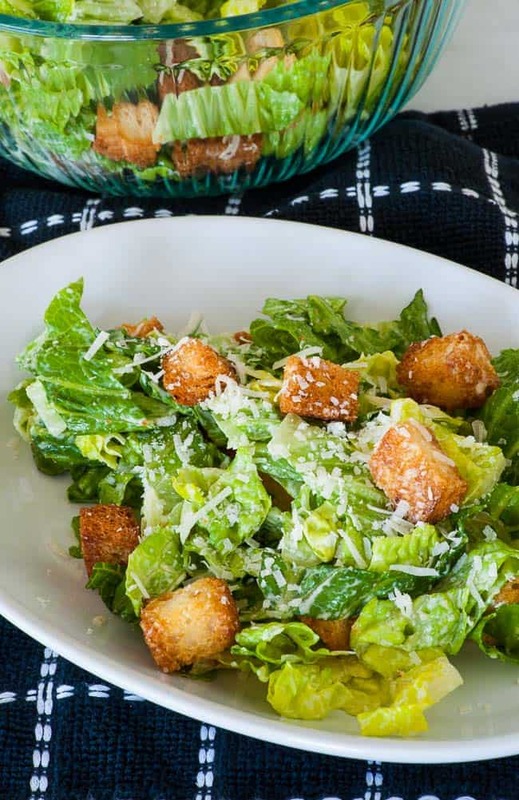 Caesar Salad has always been our favorite. This was perfect with Italian spaghetti and garlic bread! I guess I’ll have to try this. 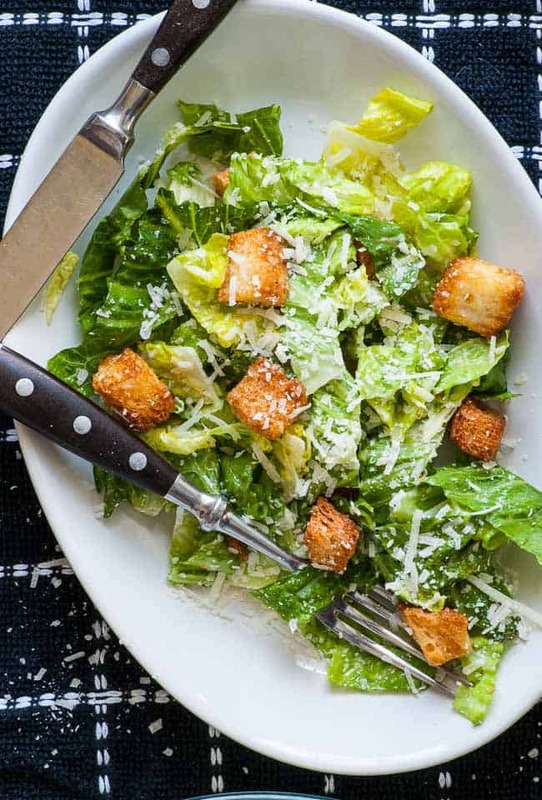 We love caesar salad.